Well it's been a while now hasn't it? Between everything going on with the new project and finishing off my senior year at SCAD it's been a crazy few months! I'll keep this short but be back again soon with more entries. 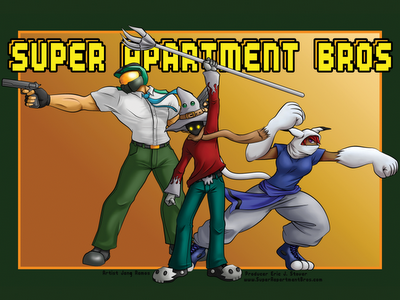 Super Apartment Bros was a great success on kickstarter, raised well over our goal though I'll have to talk all about that another entry. Got a lot of tips for anyone considering starting their own kickstarter project. Check back for that next week! Had to push the release date back for the series by a few months as the project has been growing to new territories. It hasn't been easy, a lot of bumps in the road but the whole thing has been an experience. We're coming around the final lap, with half the scripts locked down and 90% of the sprite work completed. Storyboards and animatics are coming together nicely and I'll be handing those off to the animators in the next few weeks after I get the final voices in. It's an exciting time and I'm sorry I haven't been keeping this updated to type it all out!